Western Australia: 1854-55 4d blue, error frame inverted, used. 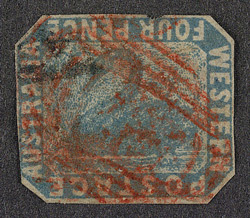 bl.uk > Online Gallery Home	> Online exhibitions	> Philatelic rarities	> Western Australia: 1854-55 4d blue, error frame inverted, used. The first Western Australian stamp, a 1d black, was issued in 1854 and was printed by Perkins, Bacon in London. The need for 4d and 1/- stamps was soon established and these were printed in Western Australia from lithographic printing stones with transfers derived from the 1d stamps. Both the 4d and 1/- stamps were made up of two transfers, one for the Swan and one for the frame or lettering. In placing one of the transfers for the frame for the 4d value it became upside-down or inverted on the stone in relation to the Swan. The resulting stamps, error “Frame Inverted”, are some of the rarest, only fourteen being recorded. For many years it was believed that the error was “Inverted Swan” until the original printing stone was found, and the truth discovered.